If you are wondering why we don’t call it guacamole, it’s because Guacamole usually has more ingredients, such as tomato, onion, cilantro, etc. 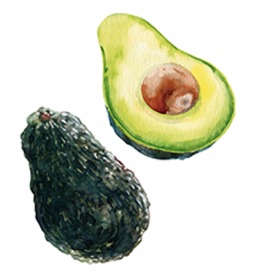 Avocado has become one of the most fashionable ‘superfoods’ around. It’s delicious, exotic and makes any dish attractive, but it also has a lot of beneficial properties: antioxidants, fatty acids, vitamins, etc. You don´t need much to prepare it at home and this recipe is suitable for anyone, even for those who never have set foot in a kitchen. To prepare the avocados (which must be ripe but not too soft), first, we cut them in half and remove their seeds, then, extract all the pulp with a spoon. Crush this pulp in a bowl, either with a mortar or a fork, and add the half lemon juice and a pinch of salt. It’s that easy! Without having seen Ratatouille or opening any bottle, a simple recipe that will give a new appearance to your dishes. Try it at breakfast, with a slice of whole wheat bread, spread the avocado and add a splash of olive oil. Here’s a little trick: avocado oxidizes very fast but if you put the seed back in the bowl with the smashed avocado, it will preserve better. The avocado is a very delicate exotic fruit. Both when buying it at the market or storing at home, you must follow some steps so it doesn’t spoil or corrupt the flavor. We review here some common mistakes made when cooking recipes with avocado. We have them very present! Do not store the avocado in the fridge unless its ripe. Keep in mind that it comes from a tropical climate, cold is not his friend. By storing it in the fridge, the only thing we will do is make difficult or break its maturation process. Do not peel the avocado with a knife. Google ‘avocado hand’ and you will know what we mean. Its better to open it in two halves, take out the bone and remove the pulp with a large spoon. Although it has healthy fats, the avocado is a fruit with many calories, but considerably less than you think. In addition, its fat is beneficial and barely contains sugars.